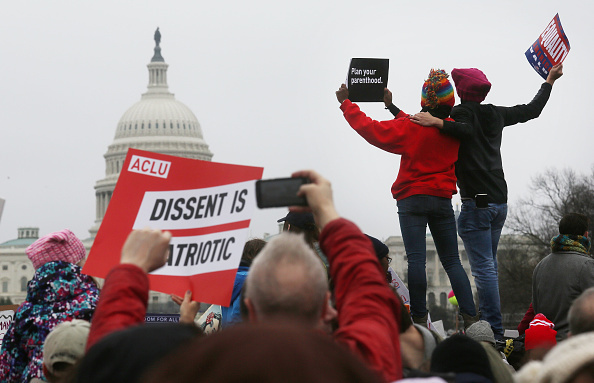 On the ground at the Women’s March in Washington, D.C, we found it so heartwarming to see all those people out in the streets for justice and human rights. As impressive as all those massive crowds were, however, we also remembered that a crowd is made up of individuals. We wanted to find out the reasons individual marchers had come to Washington, and so we interviewed several protesters. Their reasons for being in Washington were an amazing rainbow. Some came for the kids in their life.
" I’m here for my son. Mothers keep losing their children to gun violence. I feel that our pleas to Congress fall on deaf ears. Congress needs to act. This isn’t just politics, this is a public health and safety issue. I haven’t lost my son, but I’m here for him and the other mothers that have lost children." Others just felt that this was the wrong time to be silent. "Because it’s no longer ok to sit and be complacent, I can’t tolerate attacks on those who are close to me." "I feel that I have to." Not surprisingly, the new administration was a major motivating factor. "The election proved that the new President is anti-healthcare, anti-choice, and wants to pit us against each other. I’m marching for children, to be an example, and for fellow women, so they know they’re not alone." "It's important to come out. He's not my president." But there was a fierce core of hope, determination, and the desire to fight for equality for all. "Because women will write the future." We were honored to meet so many protesters, each there with their own reasons and motivations. Together, we will all write the future, and yesterday was an inspiring beginning to the story we want to tell.